AW: Best advice you could give to a younger you? Victoria: Don’t be afraid to lose. AW: How did you get interested in wrestling? 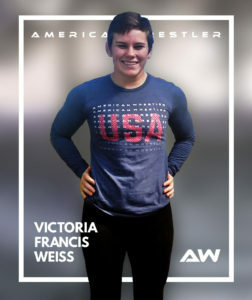 Victoria: My brother had wrestled the year before me which exposed me to the sport. I’m not entirely sure why I wanted to but I’m glad I was crazy enough to give it a try. AW: Where are you training right now? How do you feel your training is going? Victoria: I recently moved to Maryland. Most of my training out here has been with guys, so it’s been taking some adjusting to get used to wrestling guys again. But it’s going well and is definitely making me more resilient. AW: Congratulations on your 1st year of marriage, how has being married impacted your training? Victoria: Most of our first year of marriage we didn’t live together due to my training. But our move to Maryland was us moving in together. Recently it’s been strange because as an athlete, I can be very selfish. I’m worried about what I’m eating, how I’m spending my free time, etc. But with a husband and dog, I’ve noticed that life no longer revolves around me. But it’s also had its perks. My husband is very supportive of me and gives me encouragement when I’m frustrated or exhausted by wrestling. AW: Which tournaments do plan in competing in next? Victoria: US Open 2019 is my goal, maybe something sooner. AW: Are you currently employed, if so what are you doing? Victoria: I am not employed. But I am starting up some freelance web design work and trying to teach myself graphic design. AW: During your free time what do you enjoy doing, hobbies? Victoria: I love lazy time. Netflix, feet propped up, and playing around on my phone. I also enjoy going on walks with my husband and dog. AW: If you won the mega million lottery, what would you do with your winnings?